If I change the code, then inspections in code should stay connected to the marked line and only disappear if I explicitelly delete that line of code, until a new analysis is done. If new analysis is done, the annotations needs to be updated instantly in editor. This does not work using LocalInspectionTool. This way I can immediatelly trigger a new sonar analysis. I also instantly remember that and which script is running. After Analysis is done the results are stored in my own cache. Unfortunatelly this does not work as expected. then it see My inspection did not generate any ProblemDescriptor and did not show anything until it is blocked by the analysisIsRunningFor() precondition. so new code annotations do not appear and the result is that code is not annotated at all any more. *) How to keep already created ProblemDescriptions in place, also if I edit the code and produce compile errors and the line of code is moved? **) How can I trigger running of a LocalInspectionTool on a File after analysis is done? ***) I want to keep the Sonar Rule == Intellij Inspection connection, how is it possible if I do not use LocalInspectionTool? Many thx for reading and any help! Using markupModel.addLineHighlighter I am able to create makrings in editor which do not disappear during editing the source code. But I am missing the popup on mouse over, also that popup has a F1 functionallity... I really don't want to reinvent the wheel and create all of this manually. My next question is: how do I create highlighting for a ProblemDescriptor manually without LocalInspectionTool ? What is UnfairLocalInspectionTool for? 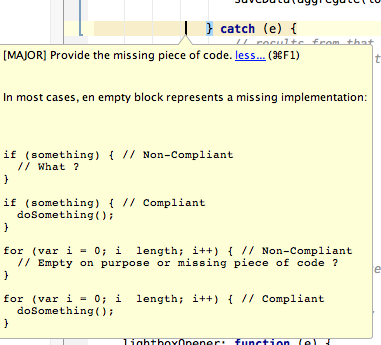 There is no javadoc or any explanation, also nothing to implement. How do I trigger rendering of List<ProblemDescriptor> in Editor? Things would not play ball till I wrapped the code block with ProgressManager.getInstance().runProcess.